As you might know we are doing this great project in cooperation with Louisiana Museum and five schools from the local area, called ‘The Architecture Around You’. Through the fall the students will be working on a suggestion to an urban space or a cultural house in their neighborhood and our task is to inspire and engage them through architectural workshops. 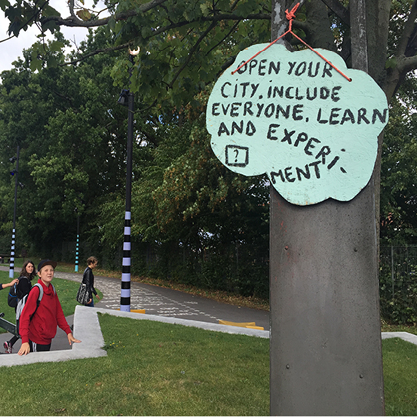 The last week we made several field studies trips with the different classes to the new library in Nordvest and the nearby “Stjerneparken” (Starpark) to show them an example of an innovative cultural house and urban space. The library, with its innovative and varied architecture, is the perfect learning environment, where the students can reflect upon the effects that spatial design has on us. Stjerneparken is an interesting urban place because of the userdriven planning process, where the locals has been a big part of the design process. It brings a very personal feeling to the park with poems on the concrete and religious signs that show the cultural history of the area. The kids teamed up in groups and were asked to take pictures of either the different functions, light, usergroups, materials or the different stories that lies in the building or urban space. They went on adventure with their smartphones searching for the right angle, and the silent library filled with life and laughter. After the exercise each group presented their favorite picture and the history behind it. They came up with some interesting perspectives about the history of the library – for example one group explained about how the stairs at the library binds the old and new architecture together (shown in the picture below) and how the building resembles the function of the library in the sense that it looks like a bunch of stacked books. The whole idea behind the exercise is to practice the young kids ability to communicate their project in the best possible way and that they experience the different aspects/concepts that lies behind the design of a new building or public space. Also we want the kids to experience that they are able to affect urban space and that their voice are valuable and important in the planning process. We are very happy with the cooperation with Louisiana Museum of Modern Art, and we are looking forward to see all the different ideas of the students, which will be exhibited at Lousiana Museum and presented to the municipality of Fredensborg. We’ll keep you updated, and thanks to huskunstnerordningen for making this rewarding cooperation possible!